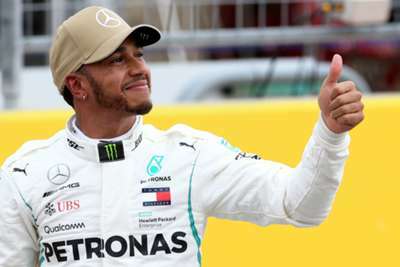 Formula One champion and Mercedes star Lewis Hamilton said he was in a "different headspace" after claiming pole position ahead of Ferrari for the United States Grand Prix. Hamilton moved a step closer to another F1 title by earning pole in Austin, where he posted a time of one minute, 32.237 seconds on his final flying lap to top the leaderboard on Saturday. Hamilton – who has won the last four races – revelled in his performance as the four-time world champion stands on the verge of back-to-back F1 crowns with three GPs remaining. "I knew it was going to take perfection and neat laps to take them," said Hamilton. "The first lap was good, but being that I was less than one tenth ahead I knew the next lap these guys would improve also, so there was no room for error. "Considering there's been some Q3s in the past races where I have had to bail out, the second one as it was not good enough - I was very strict with myself today, to pull through the second lap. "The approach for us has been very sturdy, we've not been getting ahead of ourselves. I'm so happy. It was a different feeling today coming in. I don't know why. "I don't know if I slept longer or what but I was in a different headspace going into qualifying, which is weird, but it was a good one." Yeehaw! Three in a row in Austin! Hamilton added: "There's so many different variables, you are really just on your tippy toes the whole way, trying to catch it and grab it - utilise grip. "Some of that it is Turn 1, I would say mostly, they generally have a car that's better in corners like that. The rest of the lap was good, there were no mistakes. "The first lap was quite good but there was a little bit of time in a couple of corners - Turn 11, Turn 12, maybe 13 and a little bit in 20. That second one I was able to capitalise." Meanwhile, Bottas said: "It was a pretty straightforward qualifying session all the way until the second run in Q3. "Everyone else improved much more on their second run, but I could not find more grip. You want the tyre pressures and temperatures to be in the optimum window for those qualifying laps."